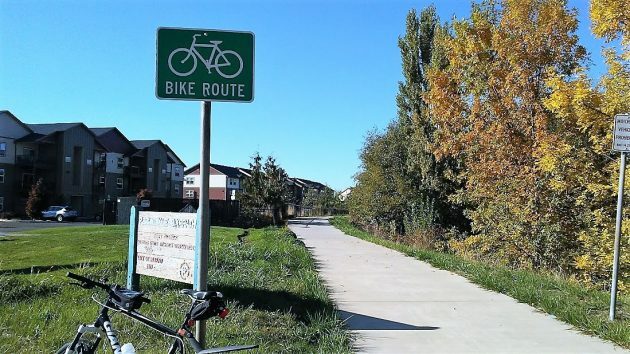 » Bike paths in another 40 years? Bike paths in another 40 years? The Periwinkle Bike Path’s entrance on Albany’s Queen Avenue on Oct. 14. The path was built in 1977. It’s been 40 years since Albany, with the help of the state highway department, built the Periwinkle Bike Path. Now a class of university students has recommended another “increase in bicycle infrastructure,” but I wonder if anything will come of that. The recommendations came from a University of Oregon class on “Topics in Bicycle Transportation.” The students took part along with many other classes in the $254,000 partnership with Albany under the university’s Sustainable Cities initiative. A summary of their recommendations is on the city council’s agenda Wednesday. The suggestions range from the routine to the impractical. They are for things like installing bike boulevards, bike signals and even wayfaring signs (as though people on bikes can’t read street signs). They call for planning city events to encourage cycling and to get children interested. There’s even a suggestion for a kids’ bicycle map — as though today’s parents would allow their children to ride bikes to explore distant parts of the city they would need a map to find. The Perwinkle Bike Path was the result of a similar student exercise. A group of OSU seniors including Tom Uppstad working on a class assignment designed the path in 1973. (Uppstad told me about this years ago and later mentioned it in a letter to the Democrat-Herald.) The 1.7-mile path was designed for transportation, but if you want to get somewhere fast on a bike, you’re better off riding on the streets. Though the future is hidden from us, developments over the next 40 years may make separate bike paths for urban transportation unnecessary. If self-driving cars become the norm, surely they will include features to recognize and avoid obstacles including cyclists, a big step toward greater safety for all. And if we eventually ban cars powered by fossil fuel, maybe that will change living patterns so that people have less far to travel to get anywhere, which might lessen motor traffic and increase the use of bikes on our streets. I never imagined a time when your sentence, “if we eventually ban cars powered by fossil fuel, maybe that will change living patterns…” could have been composed on any keyboard you might be seated at. Yet, there it is. Hasso Hering calling for a New World Order. If that means riding a bike in car-free paradise to work or shopping instead of languishing in car traffic for about the same duration, then bring it on! I can’t imagine an easier way to better health and happiness. I’d settle for less than a New World Order. In fact, I’d settle for just having a few cities where cars are separated from people far enough so I don’t need to see, hear, smell, and avoid them to save my life, most of the time. There are very few of these places on earth because the unquestioned default is always motor-roads and parking in front of every house, every business, every place anyone goes to. No, it’s the old new order of the USSR. H. R. I have zero idea what you are typing about but you do bring up the obvious. must be spinning in his grave.